Ideally located on a quiet street steps away from Flax Pond, and just over 2 miles to Mayflower Beach, plus convenient to all that Dennis and the Cape have to offer. Decorated with local art and pottery, along with antique pieces discovered in the area, this charming cottage is the perfect Cape Cod getaway. A great traditional knotty pine cottage with inviting living areas highlighted with vaulted wood beamed ceilings, it is appointed with a fully equipped retro kitchen with breakfast bar seating and skylight. The inviting living room space is bright and airy, and has a sleeper sofa with full size bed. There is a dining table for 4, and an additional sitting area to relax in. The two cozy bedrooms are also tongue and groove pine panelled; one with a full bed, the other with a twin bed. The comfy nook in the sunroom, with antique daybed equipped with custom mattress and box spring, is a wonderful spot to curl up with a good book, or to sleep the night away. The cottage has one full bath with stall shower, a 32 Inch Hi Def TV , Cable, High Speed WIFI, gas BBQ grill, wood shed with beach supplies, 2 bicycles, and 2 kayaks, and an outdoor deck with a dining area where you can sit back and enjoy. There is a window air conditioner and tower room fans if needed, and a wonderful cross-breeze that usually comes through the many windows of the cottage. A private outdoor shower with hot and cold water and separate changing area provides the perfect experience after a day at the beach. The nearby beaches are perfect for young and old alike. Splash around in the bay beaches at high tide or explore the miles of tidal pools at low tide. You can also choose to walk around the corner to secluded Flax Pond (cottage has deeded beach rights), which provides a nice alternative to sunny days at the ocean. You’ll love being able to kayak, canoe, sail a sunfish, swim, or float the day away, in the shady calm warm water Flax Pond provides. Take a relaxing walk through the miles of nature trails that surround Flax Pond, and discover the second small sandy beach on the other side of the pond. Dennis offers 16 beaches including Cape Cod Bay, Nantucket Sound, and numerous freshwater ponds. There are 2 championship golf courses, and a charming village with many quaint shops, restaurants, ice cream parlor, library, The Cape Playhouse, Cape Cinema, art galleries, and museums, all located a few minutes away on historic Route 6A. And let's not forget Captain Frosty's, one of Cape Cod's best seafood shacks, just a short walk outside the neighborhood, for some delicious fried seafood and chowder, or for a sweet ice cream treat! 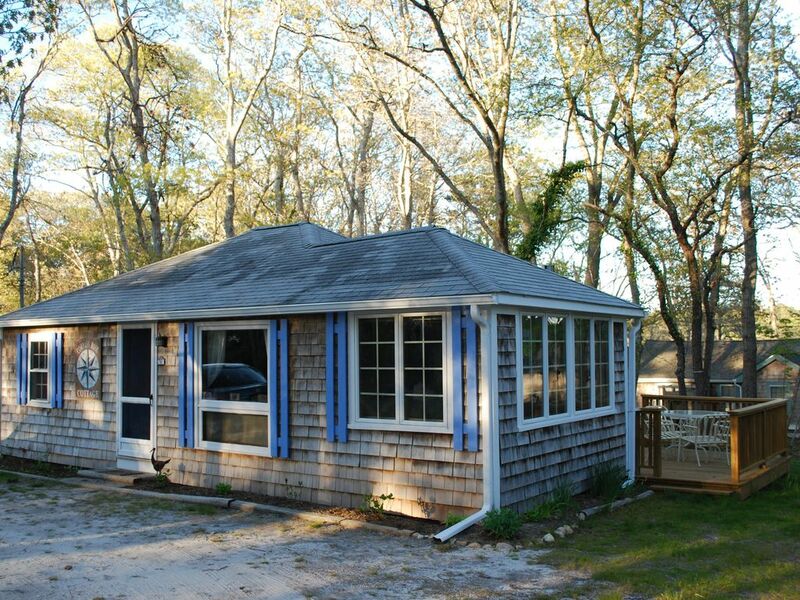 We feel you’ll agree that Compass Rose Cottage is the perfect place to create your wonderful Cape Cod memories. We are always available through a text, email or phone call. 2 night minimum during off-season / Contact owner for off-season weekly rate. Weekly rentals only during the summer months: Saturday to Saturday. PLEASE NOTE: Stays of 3 nights or less will be charged a discounted cleaning fee of $20. PLEASE NOTE: Because there is not a washer or dryer at the cottage weekly guests are asked to bring their own sheets & towels. If you are unable to bring your own linen, please arrange with owner prior to booking to have the cleaning service supply them for an additional fee of $35.00. The Compass Rose Cottage provides a traditional Cape Cod getaway experience that is a wonderful escape from everyday life. Located in a quiet neighborhood, steps away from a lovely shaded fresh water pond surrounded by trails, it is the perfect spot to get outside and explore from. With its close proximity to Dennis Village and its central Mid-Cape location, it is the ideal location to enjoy all that Cape Cod has to offer. outdoor shower, Fully enclosed outdoor shower with hot & cold water. One full bathroom with stall shower, and an additional fully enclosed outdoor shower with hot water, foot washer, and changing area. Window unit, along with room fans provided. Pull out sofa with full size bed. The cottage is warm and inviting, a perfect place to getaway from it all any time of year. I stayed at the Compass Rose Cottage in during the off-season (in late March) I thought that it might be useful to write my review from that perspective. Because I was coming in late March, I knew that I could not count on the weather. It could easily be raining or even snowing at this time of year. With that in mind, I looked for a place that evoked a sense of retreat and comfort even if I was limited to my use of the outdoors. This cottage was exactly what I was seeking. From the moment I walked in I felt comfortable and at home. I was lucky with the weather and was able to spend much time outdoors, but I would have been just as happy spending time in the cottage. One reason is that the sun-room, the skylight and the many of windows in the cottage bring the outdoors into the indoor space. The cottage is well-stocked with all the necessary items to cook and prepare most any type of dish. The linens or lovely and the bed, sofa and daybed are all comfortable. The neighborhood is peaceful and pleasant for walking and biking. One of great bonus provided by the cottage is access to the hiking trails around the Flax Pond. You simply need to walk a few blocks down the street to enter the wonderful system of trails that take you all around the pond. Even with the trees bare in early spring, the area around the pond is beautiful and inspiring. Carol and Gene were great hosts both before and during my stay. They also helped out with restaurant recommendations and information about other things to do during my visit. I have already booked another stay at the cottage in the fall, and most likely will make my March retreat at the cottage and annual trip. After 10 years of not coming to the Cape we were looking forward to returning to all our favorites spots and found that this cottage had a great location to do that. The inside was so charming and was supplied with every-thing we could have needed. In 4 days we never turned on the TV and never missed all the blah, blah, blah. While there are 2 bedrooms that could sleep 3, there are 2 additional places that could sleep 3 more. While Flax Pond is a pretty one, and only a short walk away, we chose to go back to Scargo Lake, the Walk to No Where, Sandy Neck and Provincetown. We saw the seals in Chatham and had the best Oysters Rockefeller at, of course, the Impudent Oyster. We tried a newer place for lunch called Branches that gave out samples of their Pumpkin soup and it was convincingly good enough for us try a walk on the wilder side (for Us). Outstanding! So glad we went and recommend it to first timers. And, that's true of Compass Rose too. If you are looking for a place to stay that's not a cookie cut hotel room that you will forget next week, try Compass Rose. It's a great place to build happy memories. This is a charming cottage in which the owner has taken extra measures to ensure a comfortable stay. We recommend it! We were happy to hear how much Susan and her friend both enjoyed their stay! We hope to have them back at the Compass Rose Cottage the next time they visit Cape Cod! We loved the Compass Rose cottage - it was very clean and well maintained with all of the amenities one would need for an enjoyable stay. What was amazing was how close we were to upper and mid cape places we wanted to explore. The neighborhood is quiet and the hiking trail by the lake was a definite plus for us. We didn't get a chance to ride the bicycles or use the kayaks only being there two nights but will the next time as we are already planning our stay again for next year. The Compass Rose is an excellent value in the heart of the Cape. The hosts, Carol and Gene were friendly and very easy to work with. Thanks to you both for such a pleasant time. We were so happy to have Amy and her friend stay at the Compass Rose Cottage for the weekend! We had great communication before,during, and after their stay, and they took such great care of things. They seemed to really enjoy everything about the cottage and their trip to Cape Cod. We're looking forward to hopefully having them back and would highly recommend them as guests. We were so happy to hear how much Helen and Kathleen enjoyed the Compass Rose Cottage. They were the perfect guests! We hope to have them back! Beautifully decorated and fully equipped with everything we needed- from a blender and cookware to bikes and kayaks and games to play at night. The bed was cozy and dressed in nice linens. The cottage was in the perfect location for exploring the cape. Carol was so easy to communicate with. I really can’t even express how amazing our weekend was. We will definitely returning to the cottage. It was such a pleasure to have Deana and her boyfriend staying at the Compass Rose Cottage for the weekend. It was their first trip to the Cape and it sounded like they really loved exploring the area and relaxing at the Cottage. They were the perfect guests, taking such great care of everything. We can’t wait to have them back! 3pm Check-in / 11am Check-out 2 night minimum during off-season / Contact owner for off-season weekly rate Weekly rentals only during the summer months: Saturday to Saturday. **There will be an added charge for excessive cleaning, equal to additional cleaning costs. ** PLEASE NOTE: Because there is not a washer or dryer at the cottage weekly guests are asked to bring their own sheets & towels. If you are unable to bring your own linen, please arrange with owner prior to booking to have the cleaning service supply them for an additional fee of $35.00.